Budapest M4 Metro Stations by Palatium Studio Ltd.
Budapest Metro Line M4 has been the largest infrastructure project of the city for the last decades. The architects aimed to provide attractiveness for public transportation through the new aesthetics and high architectural quality of a series of new public spaces in Budapest. This has met the expectations of the Client, Budapest Transport Ltd. DBR Metro Project Directorate, from the first moment. The stations of Budapest M4 can be regarded as one building of ten wings, where each wing has its own atmosphere. Palatium had a primary role in defining architectural tasks of handling spaces, functions and materials. 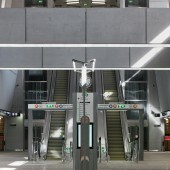 However, five architect offices (Palatium Studio Ltd., Budapesti Muhely Ltd., Gelesz and Lenzser Ltd., Puhl and Dajka Ltd., sporaarchitects Ltd.) were responsible for the unique design of the individual stations, which are results of experiments with space, structure and light. While providing attractiveness and high quality architectural environment for public transport, the project serves sustainable urban life. 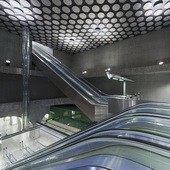 The renewal of the public urban spaces on the surfaces of metro stations could bring new elements for the pedestrian network. On that way, together with other urban programs, the construction of Budapest M4 could serve as an essential element of urban renewal of the inner city areas, too. The project started in 2004 with a design competition and the new metro line was opened to the public in March 2014. Main construction technologies have been cut-and-cover boxes bordered by diaphragm walls, divided into two or more levels by horizontal beams, slabs or pressed rings. 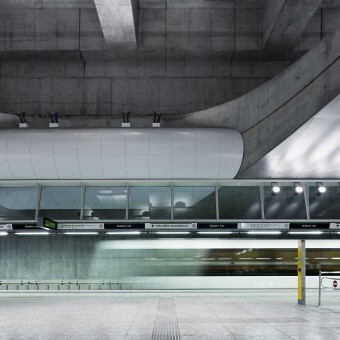 To use the possibilities of the large open spaces, there are smaller or larger openings for the natural light from the surface, ensuring that stations enjoy an atmosphere of free, airy spaces. Fairfaced concrete is used widely for the primary structures, while those elements, close to travellers are in a finer human scale. Stations of Budapest M4 Metro Line: 01 Kelenfold 02 Bikas park 03 Ujbuda-kozpont 04 Moricz Zsigmond korter 05 Szent Gellert ter 06 Fovam ter 07 Kalvin ter 08 Rakoczi ter 09 II. Janos Pal papa ter 10 Keleti palyaudvar The stations range between 6000-18000 square meters each. Research on passenger flow from and towards station exits and the most important transfer points on the surface were definitive for the general layout of metro stations. During the design process architects made a strong effort to find optimal solutions among the requirements of construction technologies, transport technologies and the creature of artistic architectural spaces. Also the strict safety regulations especially on fire protection were a challenge to meet. Nevertheless, it was functionality that basically defined architectural solutions. Image #1: Photographer Tamas Bujnovszky, Kalvin ter, 2014. Image #2: Photographer Tamas Bujnovszky, Rakoczi ter, 2014. Image #3: Photographer Tamas Bujnovszky, Szent Gellert ter, 2014. Image #4: Photographer Tamas Bujnovszky, Keleti palyaudvar, 2014. Image #5: Photographer Tamas Bujnovszky, II. Janos Pal papa ter, 2014. 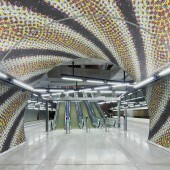 Budapest M4 Metro Stations by Palatium Studio Ltd is a Nominee in Architecture, Building and Structure Design Category. · Click here to register today inorder to be able to view the profile and other works by Palatium Studio Ltd. when results are announced. Budapest M4 Metro Stations by Palatium Studio Ltd is Winner in Architecture, Building and Structure Design Category, 2015 - 2016. · Press Members: Login or Register to request an exclusive interview with Palatium Studio Ltd..
· Click here to register inorder to view the profile and other works by Palatium Studio Ltd..
Did you like Palatium Studio Ltd's Architecture Design? 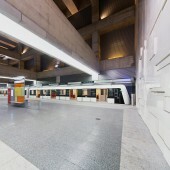 Did you like Budapest M4 Metro Stations? Help us create a global awareness for good architecture design worldwide. 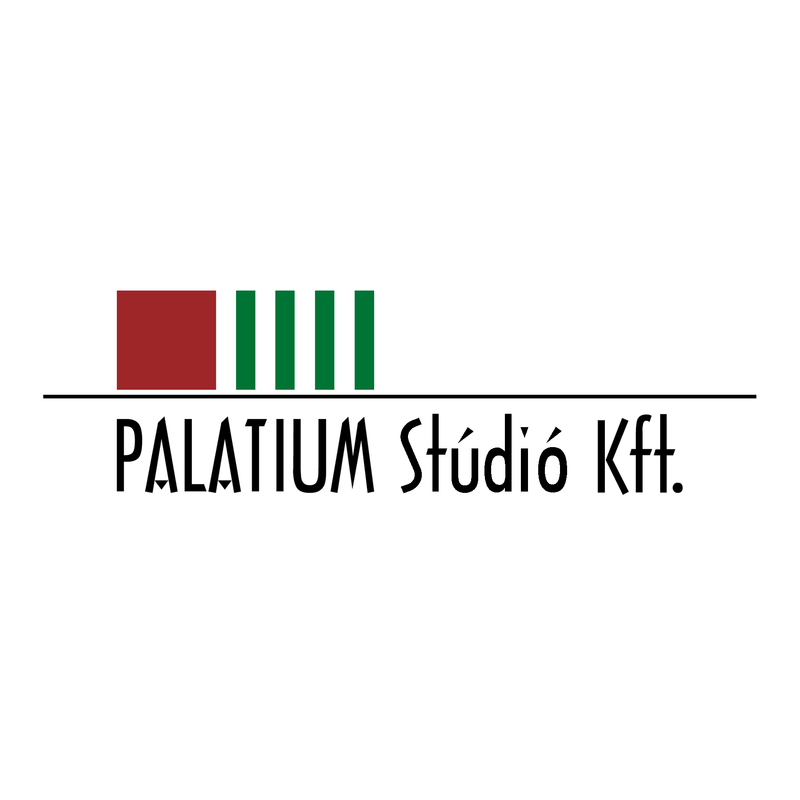 Show your support for Palatium Studio Ltd, the creator of great architecture design by gifting them a nomination ticket so that we could promote more of their great architecture designs.